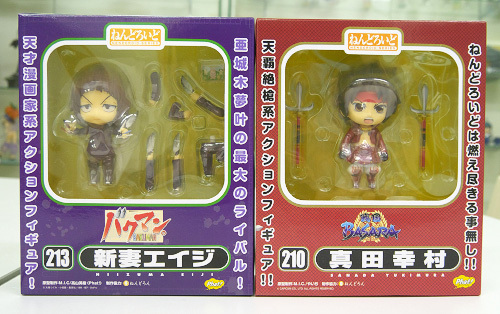 Phat Company has just posted a photo of Nendoroid Niizuma Eiji (Bakuman) and Nendoroid Sanada Yukimura (Sengoku BASARA) in their respective boxes. Yes, we have already seen Yukimura’s box a few days ago, but this is the first time we have seen Eiji’s packaging. What do you think about the design, Nendonesian? This entry was posted in News and tagged bakuman, nendoroid, niizuma eiji, phat company, sanada yukimura, sengoku basara.